These artworks have been created on the back door and wall of a house along Alice Lane, in the inner city suburb of Newtown. Linked to: Monday Mural, Amaze Me Monday, Blue Monday, Through My Lens. Looks like there should be something exciting behind that door! ...neat, looks like the circus has come to town. Nice, but what is it? 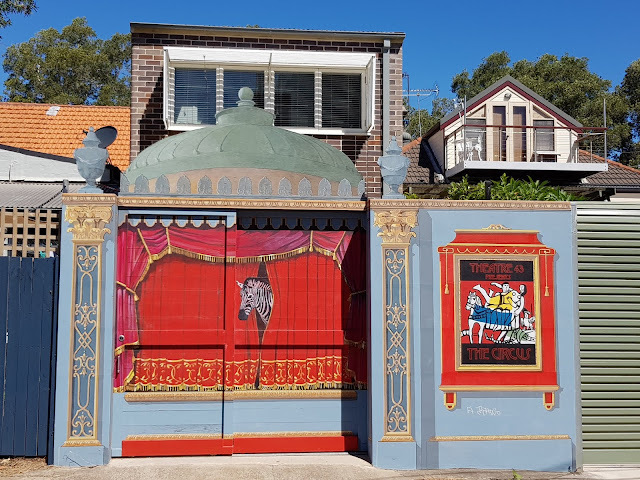 Bertiebo, it's just a regular house but they must be fans of theatre and the circus. Wow. More then a mural alone. Like it. A fun mural indeed :) Thanks for participating Jim. Thanks for visiting my blog. Please leave me a message. Jim. A new photo posted here every day from the city of Sydney, the nearby suburbs or just beyond. This sunset view across the Georges River to Kogarah Bay , is from the southern suburb of Sans Souci. Linked to: Skywatch Friday .